There is something distinctly high quality about 20-gauge steel. When you are wanting to pay tribute to your loved one, a 20-gauge steel casket is the perfect way to bring elegance and grace to the funeral ceremony. All of our caskets come with a fully insured product warranty as well as a memory and record tube. You can trust that you’ll be getting something of value and durability when you choose 20-gauge steel. 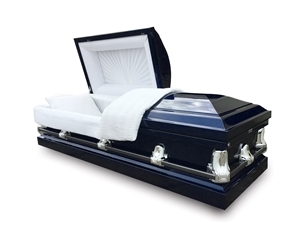 Fast Caskets offers several different stylish options in our collection. Our Heritage White casket adds a touch of opulence with its soft pink, crepe interior and intricately squared corners. If blue was your loved one’s favorite color, our Empire Blue showcases a lovely sky blue finish and detailed design. For something unique and beautiful, try our Lady Guadalupe. This casket comes with a plush, pearl interior and stunning white finish with gold highlights. Feel free to contact Fast Caskets for assistance in choosing your online, 20-gauge steel casket.